One of the most common questions we get asked at mygownpreservation.com is "What happens to my dress once it reaches the Wedding Gown Preservation Company?" It's a great question and one that we're happy to answer in detail for our brides. We know how cherished your wedding gown is to you and we cherish each and every wedding dress that arrives at our preservation studio just as much. 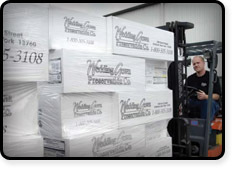 The Wedding Gown Preservation Company has been in the fabric cleaning business since 1912 making them one of the oldest dry cleaning operations in the United States. In fact, the same secret family formula's that have been passed down from generation to generation are still being used to this day. That's why more brides trust us than any other company when it comes to wedding dress cleaning and preservation. Once your wedding gown arrives at the wedding dress preservation studio it goes through a check-in process to be sure all stains are properly noted and your dress receives an identification number to be sure you can track your wedding dress as its being cleaned. The Wedding Gown Preservation Company had a special racking system from Germany designed and imported to store your wedding gown during our process. On any given day the racking system can be processing from 800 to 1500 gowns. After your gown is checked in and properly stored on our racking system, it's time to begin the cleaning process. Do you remember those tags that came in your Wedding Dress Preservation Kit that allowed you to point out to us any suspected stains on your wedding dress? At our hand cleaning station your dress is carefully inspected and hand cleaned using specially designed brushes and formulas specifically developed for delicate fabrics. All sugar stains, dirt stains, grass stains and other blemishes are treated at the hand cleaning station as your dress begins its transformation back to the day you had your first fitting at the store. At the washing station your dress is gently washed in our specially designed machines. Slow and steady wins the race at the wedding dress washing station as our machines are specially designed for the delicate materials found in the beautiful wedding gowns that pass through our doors. This part of the process removes any additional blemishes noted at the hand cleaning station at the previous station. Our dry cleaning machines were also designed specifically for wedding gowns and are a selection of the only machines of their kind in the world. Temperatures in the dry cleaning machines are fine tuned for the delicate silk and linen fabrics commonly found in a wedding dress. The exact specifications which the dry cleaning machines are dialed in at came after extensive testing and research by the Wedding Gown Preservation Company. After your gown finishes the wedding dress cleaning process it's ready for an additional inspection. At the hand repair station you dress is closely inspected for any stitching flaws, beading issues and any other damage your dress may have incurred at the reception. Any flaws are noted on your paperwork and our professional seamstress begins working to fix loose threads, tighten up any beading and repair any small tears. Many of our Brides are astounded at the intricate work completed at our gown repairing station as all the delicate details of your wedding dress are brought back to life. At the steaming station your dress begins the final journey at the preservation studio which prepares the gown for boxing and delivery. Our gentle hand steamers get out all the stubborn wrinkles and pleats which would cause damage to the fabric in your gown during storage. Your dress also receives another inspection at the steaming station to be sure your gown will store well. The hand pressing station is the final step before boxing and allows us to press and gently fold your gown into position for proper storage in your exclusive Wedding Gown Preservation Display Box. This is another rigorously tested step in our process and allows us to guarantee your preservation for over 100 years. After hand pressing, you gown is ready to complete the wedding dress cleaning process and be boxed up the trip back to your door step. The final step of the preservation process is packaging your wedding dress into your Wedding Gown Preservation Display Chest. Before your dress is packed into the display box it's placed on a formed bust which ensures your gown maintains its shape during storage and also offers aesthetic value allowing you to show off your gown to others through the preservation chest window. The box is specially treated to resist mildew and UV damage from the sun. The Wedding Dress Preservation Chest is then placed in a crush proof box and ready to be shipped to your front door. The day their preserved wedding dress arrives on their door step is an exciting day for a bride. The peace of mind in knowing you've taken the proper steps to preserve your gown for the next century and for your children to enjoy is priceless. We've preserved thousands of gowns for brides across the country and we still get excited by every thank you letter and phone call we get from excited brides, it's what makes us continue to improve our process and provide excellent service for our customers. 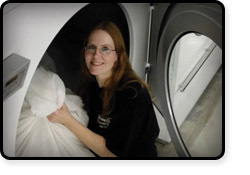 Do you have additional questions about our wedding dress cleaning process? 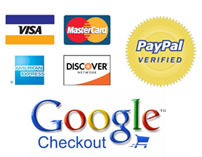 Feel free to call us or e-mail us and we'd be happy to answer your questions and assist you in ordering.